Started Martial arts training in 1973 after seeing, of course,” Enter the Dragon” like so many other kids those days. I Studied Wing Chun Kung Fu 詠春,and Karate 空手on and off over the next several years between baseball, basketball & football seasons. I never really made a commitment to martial arts until 1979 when I had the fortune to meet Gina Campbell who in turn introduced me to her father Grand Master Al Campbell, who I still consider my Sensei to this day. Training with Sensei Campbell in Robert Trias’ original Shorei Ryu 昭霊流for the next three years laid my Karate foundation in stone. His attention to detail and Spartan work ethic taught me lessons that I use to this day. Next stop, the U.S. Army. I was blessed to have some great leaders & teachers that saw me through a myriad of what the Army had to offer. During my time in the army I completed Airborne School, Air Assault School, Ranger School and SFQC. Having spent time in various bases and posts around the world has helped to shape my outlook on life, culture and the importance of education. I served in Europe, Asia, Africa and many other locales, constantly training, always learning and always trying to hone my craft. 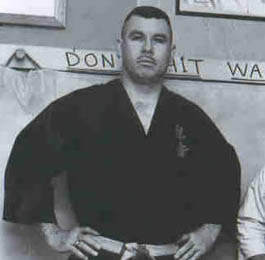 I’ve studied and trained in army combatives and continue to advance in Shuri Ryu (Trias final edition of Shorei Ryu). I have trained in Okinawan Kobudo, Kendo, Kali, Iwama Aikido, Wing Chun and consider myself a Karate lifer. I continue to feel a great deal of respect and gratitude for those Senseis, Sergeants & Masters that welcomed me into their homes, training floors and dojos with open arms and instilled in me a true Budo spirit.